Learn the right way to prep you vehicle for sale from DriverSide. It’s that time. You’ve made the decision to send your current ride on its way and get yourself a new car or truck. Though visions of carefree driving and that new-car smell are first and foremost in your mind, you have to find a home for your old set of wheels first. It may be tempting to simply stick a 'for sale' sign in the window, post it for sale online or drive it as-is to the dealer for trade-in, but you can lose hundreds, if not thousands of dollars by not taking the time to prep your car. We know the last thing you want to do is invest more of your time and money into that old ride, but trust us when we say it’s worth it. Everyone is looking to stretch a dollar as far as it will go right now, and not getting the most out of your used car is just like giving money away to your buyer. Take a look at our simple steps to preparing your vehicle for sale. Before doing anything else, take the time to get an Experian AutoCheck report on your vehicle. 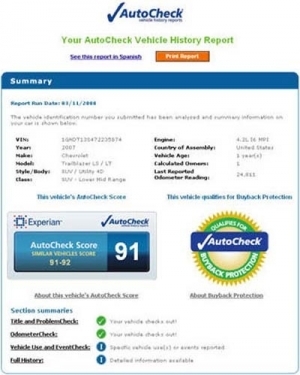 While there are plenty of services out there that offer a vehicle history report, AutoCheck is unique. The standard lemon check, salvage title alerts, odometer roll back warnings and accident reports are all there, but AutoCheck will actually give your car a score based on similar vehicles on the road. 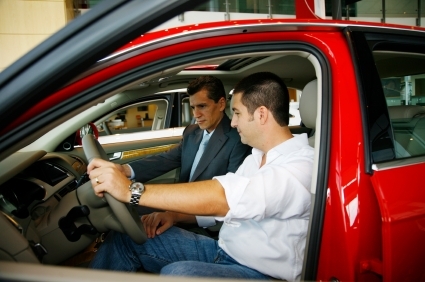 A higher score can show your potential buyer that your car is a good deal and help to put their mind at ease. You’ve probably owned your vehicle long enough to get used to any quirks it has. That means you don’t really notice the door dings, scratches or coffee stains inside, which is exactly why it pays to step back and evaluate your vehicle as a buyer. Would you buy your car? Probably not, since you’re selling it, but imagine anyway. Start at the front of the car with a pad of paper and mark down any blemishes that a potential customer could complain about. Dings, dents, scratches and stickers all need to go on the list. Once you’ve taken care of the outside, look through the interior of the car. Is anything broken? Write it down. Stained? You know the drill. Are the floor mats missing or worn? Make a note. Getting missing bits and pieces can be a headache, but having all of your vehicle’s original equipment can make a big difference in the overall value. Taken on a one-by-one basis, these things may not be a problem, but for a buyer each scratch is a bargaining chip they can use to talk you down. Knowing what needs attention on your ride is the first step toward making it right. Buying a car is a scary experience, so anything you can do to help out any potential buyers will make sure the car sells quicker and closer to your asking price. Go ahead and take it to a mechanic that specializes in your vehicle and ask for a complete diagnostic, including a print out of what they find. Some shops may even offer the service free of charge. If all goes well, your car will come back with a clean bill of health. If it doesn’t, you have two options: fix the issue, or lower your asking price accordingly. The key here is transparency. Make copies of your mechanic’s report to give out when someone comes to look at your car. If a buyer feels you’re being honest, odds are they won’t try to haggle so much with you. With any major issues out of the way, it’s time to make sure your car is running as well as it possibly can be. Go ahead and change the oil and make sure there’s no serious regular maintenance that needs to be attended to. Again, if the car needs a timing belt and a water pump, a buyer can use that to barter with you. Besides, an engine with all its maintenance squared away will run infinitely better than its mistreated counterpart. Your local mechanic or shop can tackle nearly all of your servicing needs, from simple oil changes to more complicated maintenance and repair issues. Having the work done by trained, trusted professionals can do much to build a buyer’s faith in your vehicle. At this point you have a clear picture of what your vehicle needs to be in tip-top shape. Examine your budget and fix what you can. Your vehicle’s aesthetics make up much of its worth, so if you have a laundry list of dings and scratches, it may pay to take your ride to a body shop. In most cases, small door dings and parking lot rash can be repaired without having to paint the vehicle. Paintless dent removal can save you time and money, so ask if the shop offers a similar service. Remember, the more you can fix now, the less your buyer can use to erode your asking price. It pays to get your car as close to stock as possible. While you may love your 20-inch wheels and thumping stereo, the modifications may not be for everyone. Aftermarket additions add little to no value to your vehicle, so replacing them with stock items can actually benefit you. Besides, selling those aftermarket bits by themselves may actually net you more cash in the long run. That means also removing any decals or stickers that you’ve accumulated over time. You may be proud of your square dancing bumper sticker, but that doesn’t mean your potential buyers will be. Remember what we said about aesthetics? How your car looks is like its handshake – the sharper it is outside, the more appealing it will be and the more you can ask for it. Our experts fall on different sides of the same fence when it comes to this point, but they both agree it’s essential to clean out all of your personal belongings, especially trash. Hummel says that a good, basic wash will go a long way to improving your car’s first impression. For those on a budget, many car care companies offer a number of products that can help brighten your car’s image. Dull or hazed-over headlight covers can really bring down the look of your vehicle, but for as little as $10 you can clean up those lenses with a headlight lens restorer kit. With a couple of minutes and some elbow grease, your headlights are restored to their former glory. Well worth it in our opinion. If it’s your interior that needs attention, a good interior detailer spray will help clean up the mess. Caudill, on the other hand, insists that a professional detail job will make a world of difference, and will absolutely pay for itself in the long run. Caudill added that some detail companies can even handle dent repair at the same time. Whichever route you choose, both Caudill and Hummel point out that a vehicle’s smell is just as important as how it looks. If you’re a heavy smoker or transport pets on a daily basis, a professional detail might be just the ticket. “Febreze goes a long way, too,â€ Hummel said.